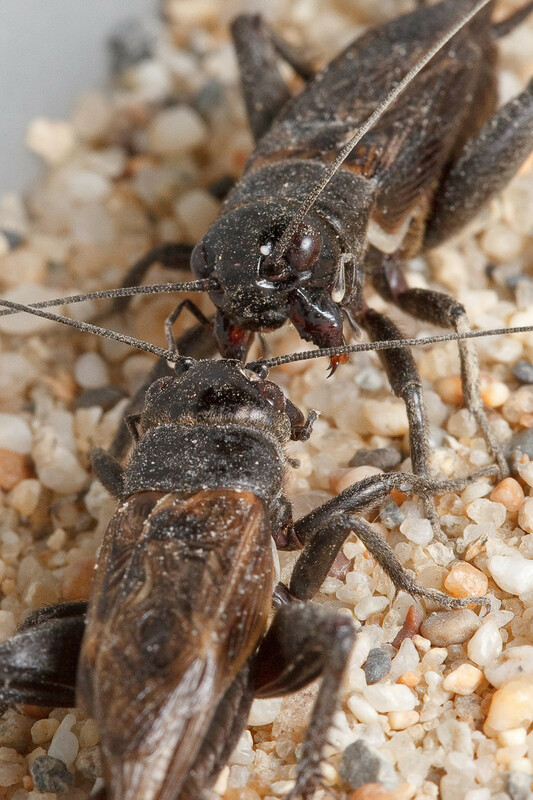 A male California field cricket flaring his mandibles as an aggressive display towards another male. Photo by Nicholas DiRienzo. At some point in your life, chances are you’ve stood outside on a warm summer night and listened to the sounds produced by a natural symphony of sorts. The countless crickets singing in a nearby field or garden create a cacophony of chirps, a wonderful and familiar sound that to some is no less beautiful than the music of a symphony orchestra full of musicians playing together. What you may not know, however, is there is a battle brewing between the different members of the natural orchestra outside. Though their song is pleasing to the ear, members of this cricket chorus are competing with one another for territories, for mates, and sometimes for their lives. Though cartoons of yesteryear would have you believe that crickets sing by rubbing their back legs together like a bow on a violin, they actually sing by rubbing their wings together. Crickets chirp by rubbing small teeth on the bottom of one wing back and forth on a ridge on the top of the other wing. Crickets will rub their wings together repeatedly into strings of chirps that comprise their melody. Only males are capable of producing these sounds and the primary reason they “sing” is to attract females to their territory in hopes of mating. Unfortunately, it is not just female crickets that are attracted to a male’s song: predators and competitors are eavesdropping on the serenade. To avoid predators, males will attempt to obtain and defend a territory with foliage or rocks, and they will use these features to hide when a predator comes near (which is why when you walk by a cricket singing near the sidewalk you probably can’t see him – and he stops singing when you’re nearby for good measure). When a singing male encounters a competitor – another male that may try to take his territory or mate with females his singing has attracted – a male is often forced to take more drastic action. A male California field cricket raising his forewings to sing aggressively at his opponent. Photo by Nicholas DiRienzo. 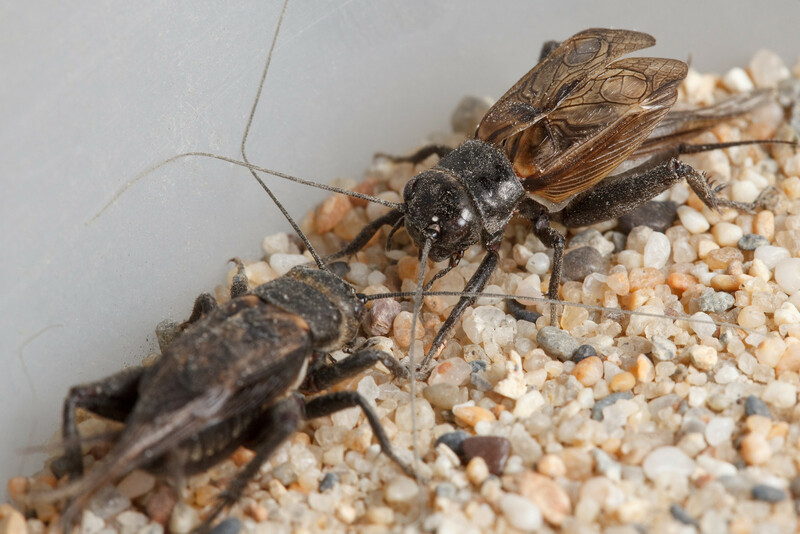 When two (or more) male field crickets meet, they will engage in a series of escalating aggressive behaviors. They typically begin these interactions with less aggressive behaviors, like touching each other with their antennae or flaring out their mandibles (mouth parts). If neither male backs down, they will escalate their interaction by biting, chasing, and singing aggressively. Even though these are only moderately aggressive behaviors, they can cause quite a big of damage (I have personally witnessed a cricket biting off and eating the body parts of his opponent!). If two males are particularly well matched and neither retreats, then they will lock their mandibles together and grapple, each trying to flip the other onto his back. They may do this for a few seconds or a few minutes, and it may take being flipped several times before the loser cries uncle, but the fight does not end until one admits defeat and retreats to safety. As is customary, to the victor go the spoils: in this case mating with any nearby females and/or residence on a desirable territory. Crickets rarely live beyond a few months; thus winning these battles is crucial in the evolution endgame. Males that lose fights may not have the chance to mate again, or they may be forced on to a territory with more predation risk and may not survive. Below, you’ll find a video of a fight between two male California field crickets (Gryllus integer). Though the territory they are on contains no females or desirable resources like shelter, food, or water, they still fight, such is their instinct to fend off other males. In the cricket chorus, you win or you die. 1) Adamo, S. A., & Hoy, R. R. (1995). Agonistic behaviour in male and female field crickets, Gryllus bimaculatus, and how behavioural context influences its expression. Animal Behaviour, 49(6), 1491–1501. 2) Bradbury, J., & Vehrencamp, S. (1998). Principles of animal communication. Sunderland, MA: Sinauer Associates. 3) Hedrick, A. V., & Dill, L. M. (1993). Mate choice by female crickets is influenced by predation risk. Animal Behaviour, 46(1), 193–196. 4) Hedrick, A. V., & Kortet, R. (2006). Hiding behaviour in two cricket populations that differ in predation pressure. Animal Behaviour, 72(5), 1111–1118.